November 1937. 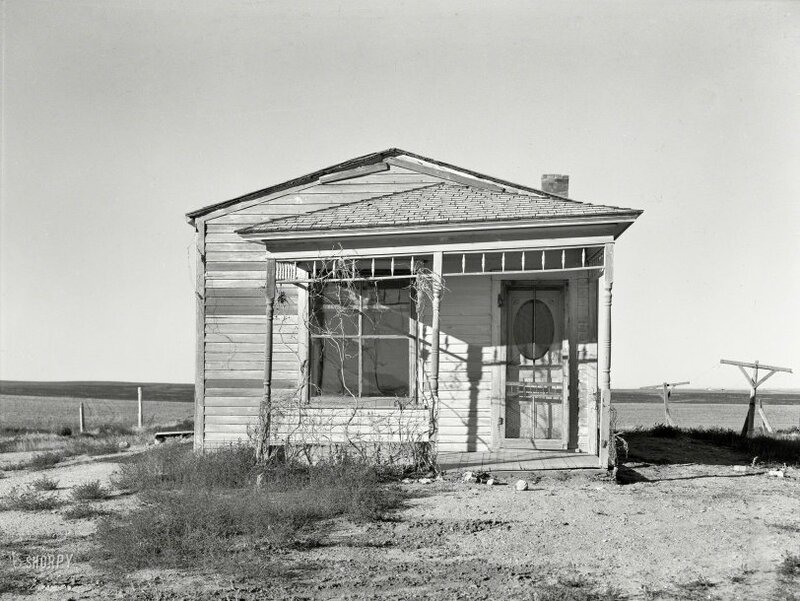 "Abandoned house near Ambrose, Divide County, North Dakota." Photo by Russell Lee for the Farm Security Administration. View full size. Submitted by wally on Sat, 03/03/2018 - 7:33am. You can see the neighbors' place from here. Maybe that's why they moved away. Submitted by Vintagetvs on Sat, 03/03/2018 - 2:29am. This is a palace compared to some of the (literal) Tar Paper shacks we've seen here on Shorpy. Submitted by Rowdy5858 on Fri, 03/02/2018 - 10:12pm. I believe the description is "ready for renovation." Well if that just isn't the tiniest little dot on the map! Submitted by Irish on Fri, 03/02/2018 - 8:00pm. Your man from Lowe's won't be delivering any new appliances here anytime soon. Submitted by rivlax on Fri, 03/02/2018 - 4:34pm. What must a North Dakota winter have been like in that little clapboard house. I wonder if it has any insulation at all. And there aren't a lot of trees out there for firewood. Brrrrr. Submitted by loujudson on Fri, 03/02/2018 - 3:04pm. All together now: "There was a crooked man ... "